Also serving communities of Madison. There are 31 Assisted Living Facilities in the Florham Park area, with 3 in Florham Park and 28 nearby. The average cost of assisted living in Florham Park is $4,880 per month. This is higher than the national median of $3,346. Cheaper nearby regions include Morristown with an average starting cost of $3,600. To help you with your search, browse the 270 reviews below for assisted living facilities in Florham Park. On average, consumers rate assisted living in Florham Park 4.1 out of 5 stars. Better rated regions include Avon with an average rating of 4.3 out of 5 stars. Caring.com has helped 5 families in Florham Park find high-quality senior care. To speak with one of our Family Advisors about assisted living options and costs in Florham Park, call (855) 863-8283. Florham Park, New Jersey is known as "A Community of Volunteers." This makes it a great city for seniors who love to get involved in their community, as there are lots of different ways to help out here. From lending a hand at the animal shelter to helping city leaders make decisions about the future of the town, there is something here for everyone. Seniors looking for an assisted living facility, there are 61 in the Florham Park area, with three in Florham Park and 58 more in neighboring towns. In Florham Park, as the rest of New Jersey, these assisted living facilities are regulated by the New Jersey Department of Health. The cost of living in Florham Park is very high; 68 percent higher than the national average, in fact. This may make living in this suburban town much more expensive than living in other areas of New Jersey. The crime rate in Florham Park, on the other hand, is more ideal. It is 68 percent lower than the national average, making this a safe town for seniors in the community. The Florham Park area is home to world-class medical facilities, including the Summit Medical Group MD Anderson Cancer Center, in the event of medical emergencies or illness. The weather in Florham Park is a bit of a mixed bag. The cooler months have highs in the 40s and the summer months have highs near 90 degrees Fahrenheit. Nearly every month sees a significant amount of rainfall, making spending time outdoors a bit difficult at times. The air quality in Florham Park, New Jersey is 6 percent worse than the national average, with pollution levels that are 61 percent worse. This could make it difficult for seniors with respiratory problems to live comfortably here. For seniors who enjoy socializing or partaking in arts and culture, the Florham Park Senior Center has tons of programs to offer. These programs include classes, computer access, and even transportation options. Assisted Living costs in Florham Park start around $4,880 per month on average, while the nationwide average cost of assisted living is $4,000 per month, according to the latest figures from Genworth’s Cost of Care Survey. It’s important to note that assisted living rates in Florham Park and the surrounding suburbs can vary widely based on factors such as location, the level of care needed, apartment size and the types of amenities offered at each community. 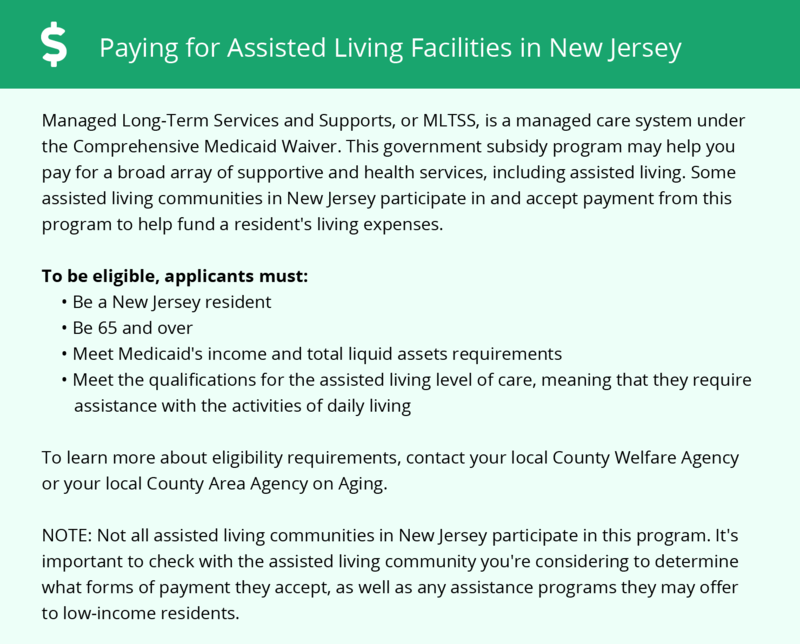 Eligible seniors in New Jersey may apply for financial assistance for assisted living via New Jersey Medicaid Managed Long-Term Services and Supports (MLTSS) waiver. 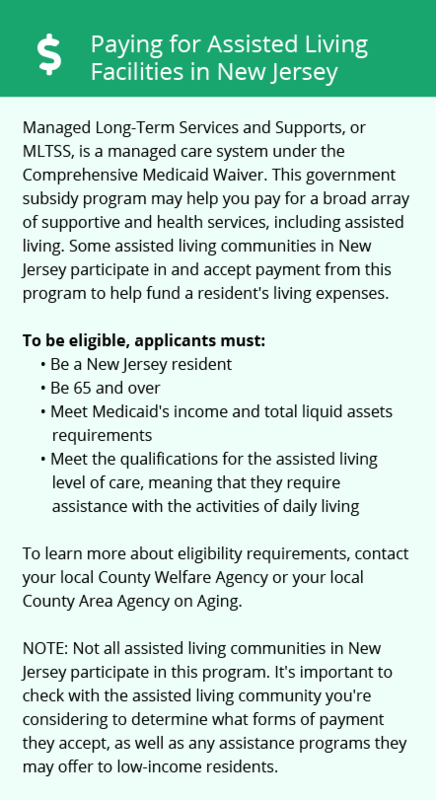 New Jersey also offers a supplemental SSI payment to help cover assisted living costs. Florham Park and the surrounding area are home to numerous government agencies and non-profit organizations offering help for seniors searching for or currently residing in an assisted living community. These organizations can also provide assistance in a number of other eldercare services such as geriatric care management, elder law advice, estate planning, finding home care and health and wellness programs. To see a list of free assisted living resources in Florham Park, please visit our Assisted Living in New Jersey page. Florham Park-area assisted living communities must adhere to the comprehensive set of state laws and regulations that all assisted living communities in New Jersey are required to follow. Visit our Assisted Living in New Jersey page for more information about these laws.